Are you worried your little one may have Autism? While doctors have become much better at recognizing and treating the disorder, diagnosing the condition can be difficult before a child is four years old. This is because the behavior and symptoms linked with Autism are also often present in children who don’t have the disorder. As a parent, it’s easier for you to recognize when something is wrong. 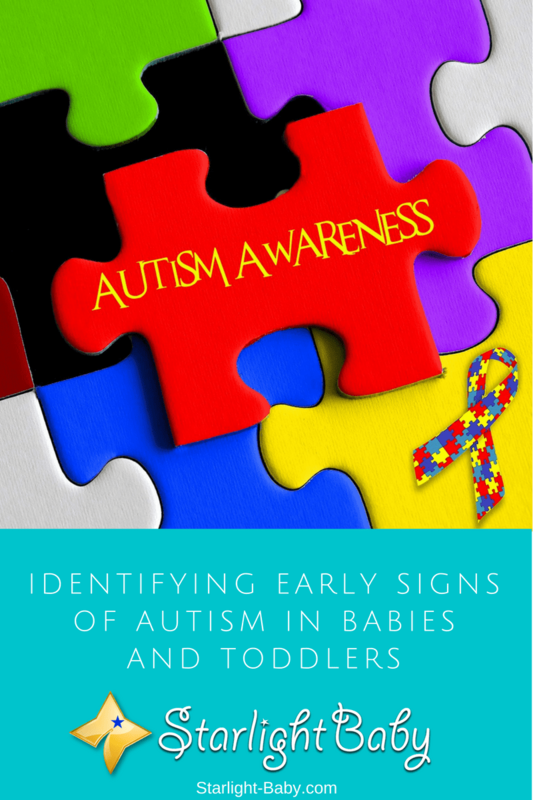 Although it is difficult to diagnose Autism there are some signs you can watch out for, even as early as the baby stage. Here, you’ll discover how to identify the early signs of Autism to ensure if your little one does have it, they can get the treatment they need as quickly as possible. Of course, it’s always recommended to verify your concerns with a doctor before jumping to any conclusions. Autism is a permanent developmental disorder which ranges in severity. It affects how the person relates and communicates with others, as well as affecting how they experience life. They feel, see and hear things differently to everyone else, though it may affect some people more than others. There’s an Autism Spectrum which diagnoses how severe the disorder is and the type of help the person will need throughout their lifetime. While there is no cure for Autism, there is help available to ensure the person can develop and live life however they choose to. These are the main early signs to look out for. As a general rule, babies start to recognize their parents within a few weeks. While vision is initially quite blurry, by the age of 8 months, they should be able to recognize you across the room. Remember, even if your baby does present some of these symptoms, it doesn’t necessarily mean they do have autism. However, it’s still worth being aware of them so you can continue to monitor their behavior and development throughout the toddler stages. Once your child reaches the toddler stage, it’s a little easier to start recognizing the signs of Autism. However, remember it’s still not a guarantee they have the disorder if your toddler does present the symptoms below. Out of the signs above, not walking is the most difficult to diagnose. Children do develop at different rates and it’s actually not uncommon for toddlers to not be able to walk until they’re 3 years old. However, if they also present some of the other symptoms above, it could be a sign of the disorder. After the age of 2, it does become slightly easier to identify Autism due to behavioral traits. However, if your child has a mild form of Autism, you may need to wait until they’re a little older to have it properly diagnosed. If you do suspect your child has Autism, the most important thing is to seek advice from a doctor or pediatrician. Diagnosing the condition can be quite complex, especially if there are other potential causes of the behavioral and developmental symptoms your child is displaying. When you do visit the doctor, it’s a good idea to take along a list of behaviors your child has. The more you can tell the doctor, the easier they’ll find it to make a correct diagnosis. It can take a while to receive a proper Autism diagnosis, so the earlier you seek advice, the sooner you can find out what the issue is. It isn’t a case of simply getting the diagnosis from your doctor – your child will also need to be assessed by other medical professionals such as a pediatrician and language and speech therapists. If your child is diagnosed with Autism, the treatment provided will depend entirely upon the severity of the disorder. Many children with Autism, also have other learning disabilities. Therefore, an individual treatment plan will be created to fit the needs of your child. In toddlers, early intervention behavioral treatment does tend to work well. Obviously, the success rate will vary from child to child, but generally speaking, it does tend to prove highly beneficial. Behavioral intervention includes a range of treatments including structured therapeutic activities and specific learning objectives. Through these, it is possible to enhance the child’s development and improve the disability. You’ll also discover there’s a lot of support available these days. If your child does get diagnosed with Autism, it’s worth joining local support groups, or even online forums. Being able to share your experience and get advice from other parents who are in the same situation can make the world of difference. Overall, it can be difficult to identify the signs of Autism early on. However, paying attention to your child’s behavior and creating a list of your concerns can really help you to receive the best diagnosis. I have read about Autism, but I don’t really know what the signs are and what to do with it. A friend told me she found out her son is a special-need kid (I do not know whether he has Autism) only when he was two years old, and she thinks he was totally normal before that. I have a toddler who is one year and seven months old, and I would also like to know if he has any symptoms. Though I do not agree with stressing it too much, I think it would be good for parents to realize this earlier so we can help the kids better. I guess we as parents need to study more and prepare the suitable environment for the kids too, if needed. Thank you for sharing the symptoms and more information about Autism. I have really learned a lot from this. You’re very much welcome, @kaka135. We’re glad this article enlightened you about autism. I guess behavioral problems like this is one of the reasons why we worry at times about our children. No parent would want any abnormality to affect their child because the child will be the most affected, but in case a child has autism, one should do his/her best to care for him/her. I have a seven months old baby. Based on the signs of autism in babies under 12 months that you have shared here, I believe my baby is completely safe from this disorder. However, I have a question. Do people develop autism since birth or can this condition also develop in later years? For example, my baby seems completely safe but is there a possibility of getting this disorder later? Hi! vinaya. According to an article from https://www.verywell.com entitled ‘Can a Person Develop Autism After Early Childhood?’, “…older children, teens, and adults do not develop autism.” It added that symptoms appear at early childhood before a child turns three at the latest. You can read the details here: https://www.verywell.com/what-is-regressive-or-late-onset-autism-260552. Testing is a good idea to detect autism in children. The article “Testing for Autism” from https://www.healthline.com indicates that “A team of specialists and experts will usually make an official diagnosis of ASD.” However, “At present, there’s no official test for diagnosing autism” because it is often difficult to diagnose. The Recommended Universal Screening Panel (RUSP) is able to identify 34 core conditions and 26 secondary conditions but this does not seem to include autism. I have two loving boys ages one and four. I was very thankful that both of them are very active and talkative. My best behavior that I can share would be talking to them more often and engaging with them on their daily activities. In that way, they can be used to talking to people. It is more about routine. I think it is really the behavior that we are correcting here. If you talk to the child routinely then there is a least chance that the kid would get autism. I know that this do not apply to all kids but it is easier to correct a certain behavior at early childhood. Children needs more affection and care. I think all parents would want their children to be more confident and more enthusiastic when dealing with other people. I’m sure you are very much thankful for having such active and bubbly children because others are not so lucky and suffer from ASD due to genetic disorders or if a mother contracted German measles while pregnant, etc. When I was pregnant with my kids, I used to ask my OB-Gyne during ultrasound examination to look closely and check if the baby’s body parts are complete, haha. The truth of the matter is that once you sign up on being a parent and after giving birth, both the mother and the husband observations and detective senses should intensify as well because it’s the only to be in front foot of finding out when any slight change is happening with their child. Autism must be handled with utmost care in order to help the child’s development because leaving it untreated would mar the child’s future. You’re right. When we become parents, we become more observant about our baby’s development. We notice changes in behavior and are able to compare them with behaviors he/she doesn’t do or used to do previously. This is the first time that I’m getting to learn about the autism sickness and the signs are worrisome that a mom that doesn’t have the knowledge of it won’t understand that the kid is suffering from it. I’m happy to have read about the symptoms to look at on matters like this and hope there will be total medication for it.